Does snail sound slimy to you? Perhaps you shouldn’t be reading this one then. Oh wait, how about ‘es-car-got’? The frou frou way of saying the same thing? Well, we call it googli in bengali. Before we moved to Kolkata, we always used to hear about ‘googli’r jhol’ that used to be the old age equivalent to a healing chicken soup meant to cure weakness. After we moved here of course, dad who has the typical bhodrolok fetish for frequenting the market and hunting down exotic items such as the dishi haansher dim (duck eggs) and shojner ful (drumstick flowers), managed to triumphantly find googli from some corner in the market. (bhodrolok= bong for gentleman) I had made it a couple of times earlier, in mom’s patronage of course. Recently when I visited her for a couple of days, dear dad suddenly dissappeared on a certain morning and later reappeared carrying these cute little things. Now the trick is to clean them thoroughly in warm water and let them blanch a bit in really hot water so that the chitaneous pedestal thing comes off easily. Cleaning bit done, just rub in enough ginger-garlic paste to cover it all, along with the regular turmeric and salt and throw it in a frying pan (with some oil of course). Add in a diced tomato, season for some spicy sweetness, top it with chopped coriander and voila! For those who dislike vagueness, here’s the structured thing. Clean the snails in hot water. Make a paste of the onion, ginger and garlic. Marinate the snails with the above paste for about 10 mins. Add the marinated snails and stir on medium heat for 5 mins. Add diced tomato, turmeric, chilly powder and seasoning. Stir fry on low heat for about 10 mins or until cooked. Optional: One could add a finel cubed potato to this dish to get more ‘body’. Next Next post: Gunpowder Kaboom! Oh wow. I remember seeing them sold at fish and meat sections of morning markets during my childhood days. So would love to try this. 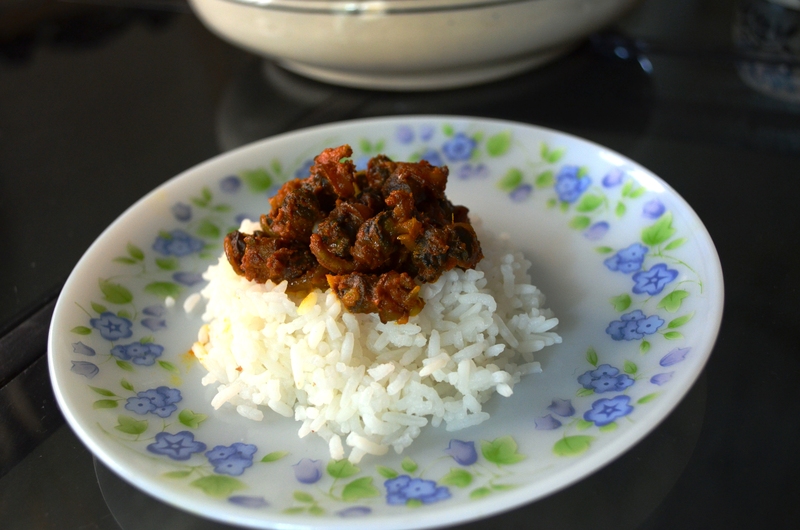 There are many other nearly forgotten Bengali recipes. One of my favourite pastime is to revive these old recipes in weekends. I’ve made ”Kul-er Daal”, ”Kul diye Shol-er tok”, ”Gugli-r jhaal”, ”Shuyor-er baadi-r jhaal”, ”Shaas-er torkari” (made with ”Daab-er shaas”) etc. There’s one recipe of Gugli, I’m still looking for. It’s called ”Gugli-r bati chocchori”. This is what we call “Googli-r jhaal”. This preparation is also mentioned in numerous Bengali stories. thanks for reading Smritilekha, keep coming!